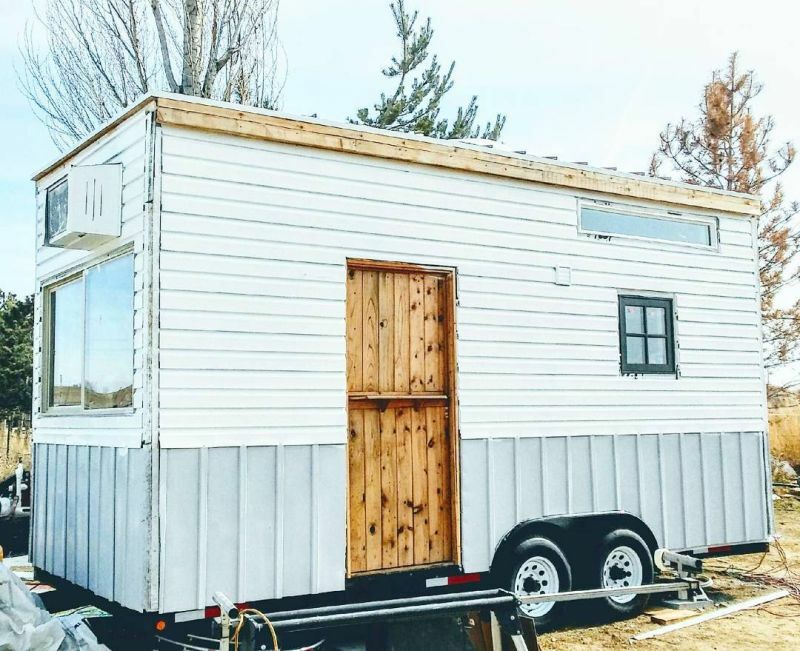 This brilliant tiny house on wheels by Idaho-based TAD Homes looks small on the outside but big enough on the inside to comfortably fit a family of three. 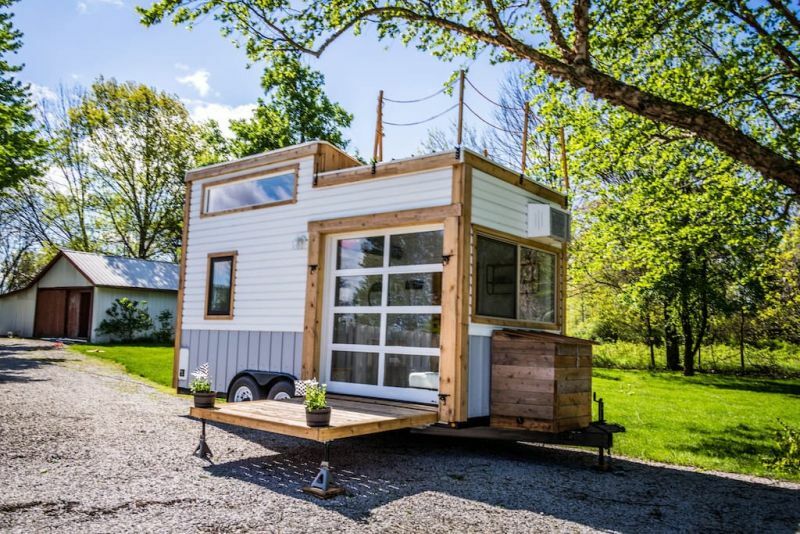 Measuring 18L x 8W x 13H feet, it packs with in a living room, kitchen, bathroom, a loft bedroom, storage and other basic amenities needed to enjoy the tiny lifestyle. 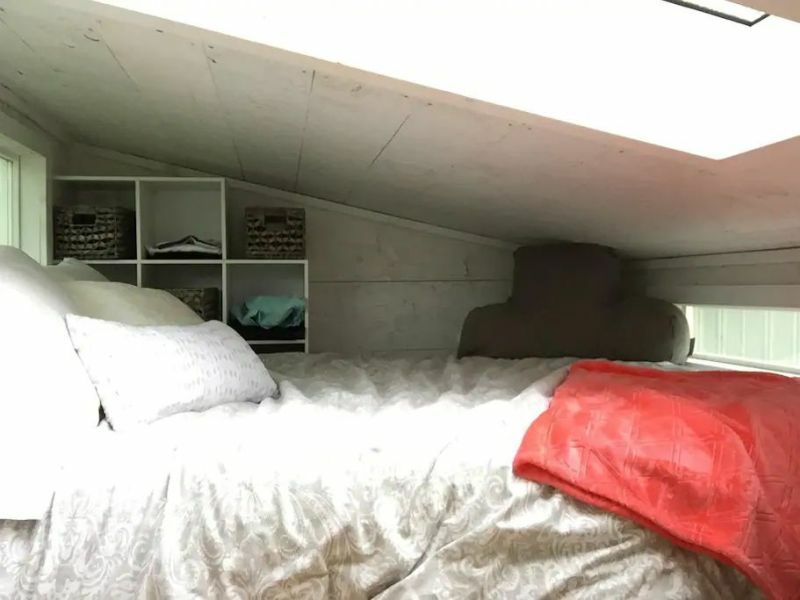 There is a rooftop deck and patio that retracts down from the garage door with a lot of glass windows to let plenty of natural light in. 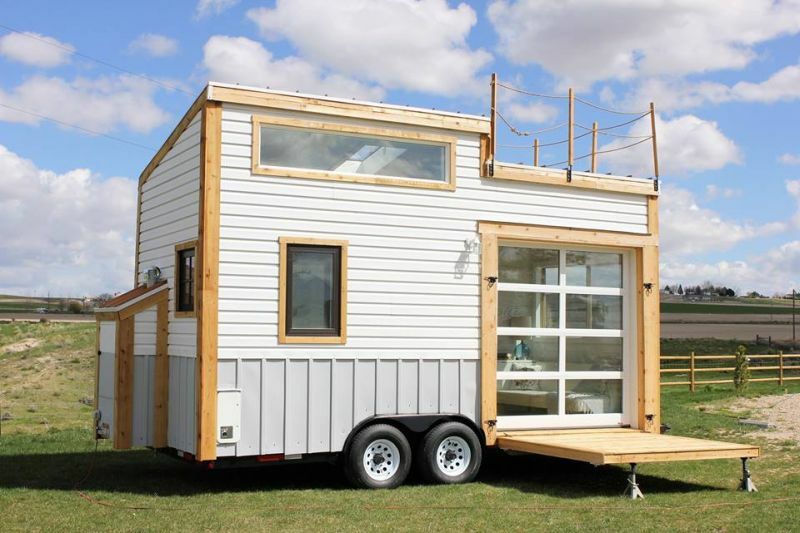 With minimal exterior and split-level roof design, it looks cool and compact. 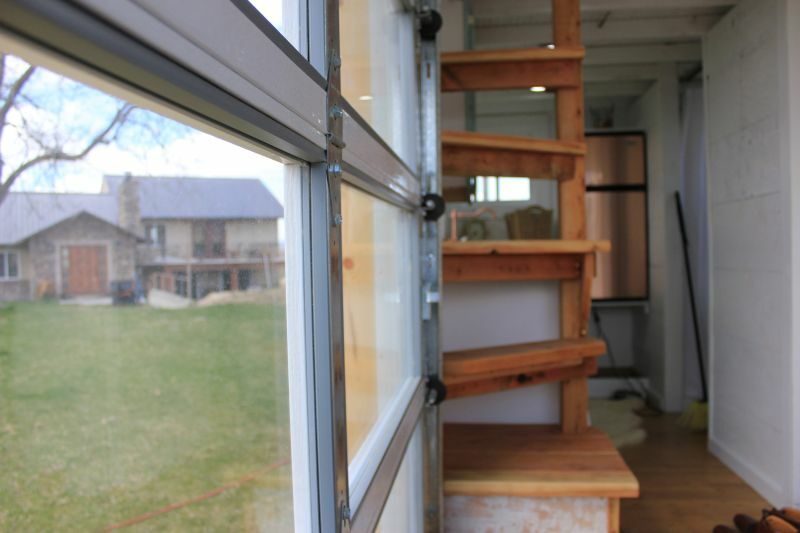 Enter the home through the Dutch-style doors and you’ll find a bright and inviting living space. 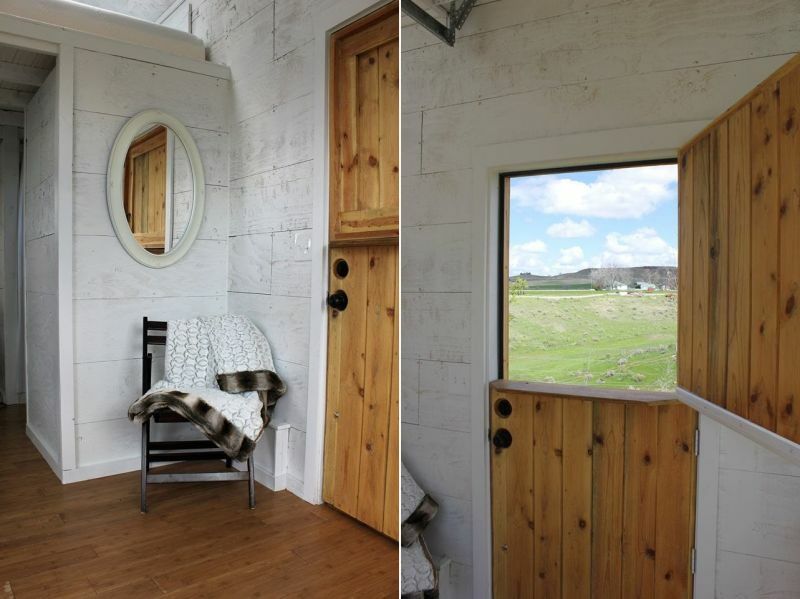 There is immense use of reclaimed wood and other salvaged materials. The reclaimed bamboo flooring and pine wood walls add charm to the interiors. 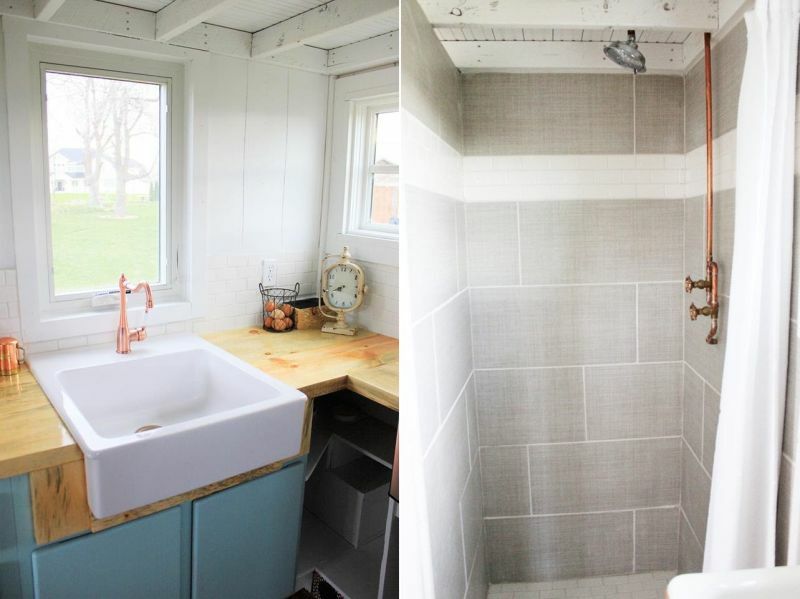 Ceiling lights made from the recycled metal drum is another noticeable feature. 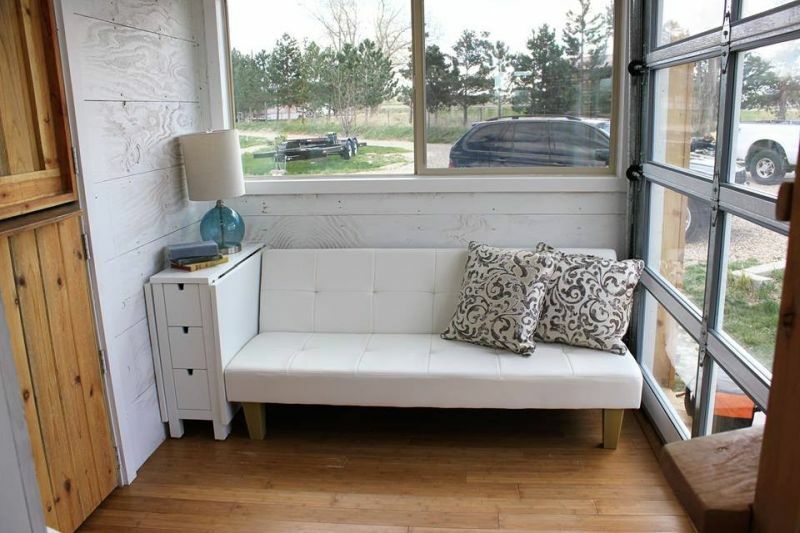 There’s a shoe rack and a foldable sofa next to the main entrance door that can be used as an extra bed. 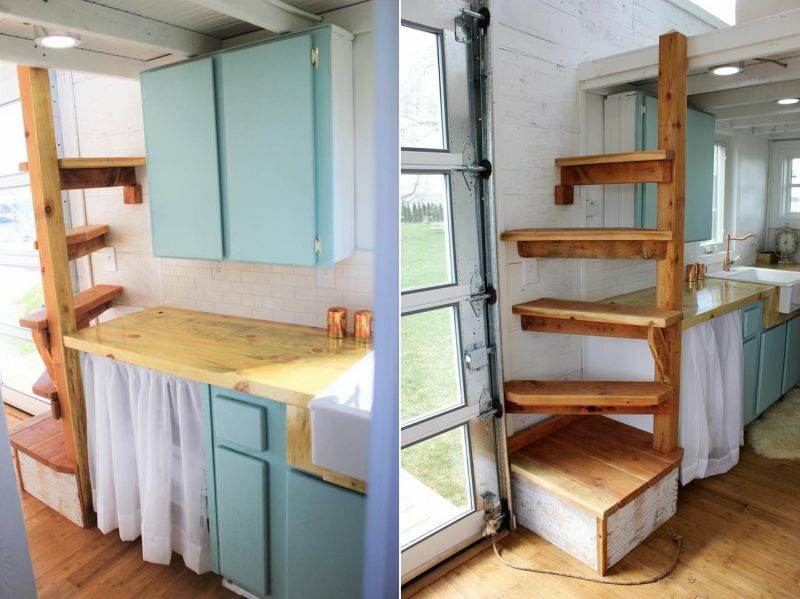 The way a pallet crate is used as a movable vanity and storage is also very clever in perspective of a tiny home. 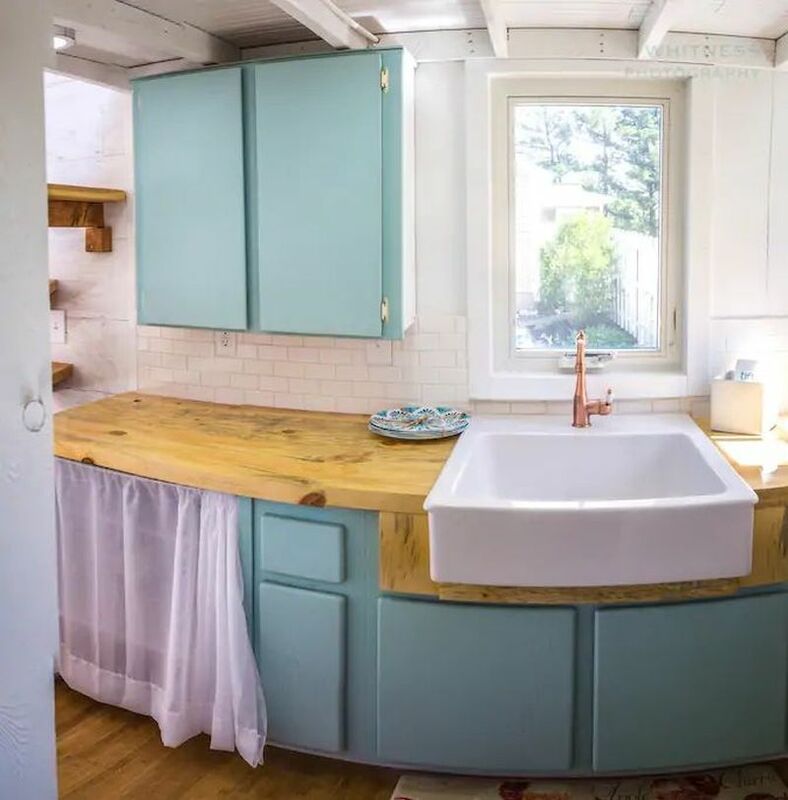 There’s a fully equipped kitchen with a two-burner cooktop, refrigerator, large basin sink, and wooden countertop and a lot of storage space. 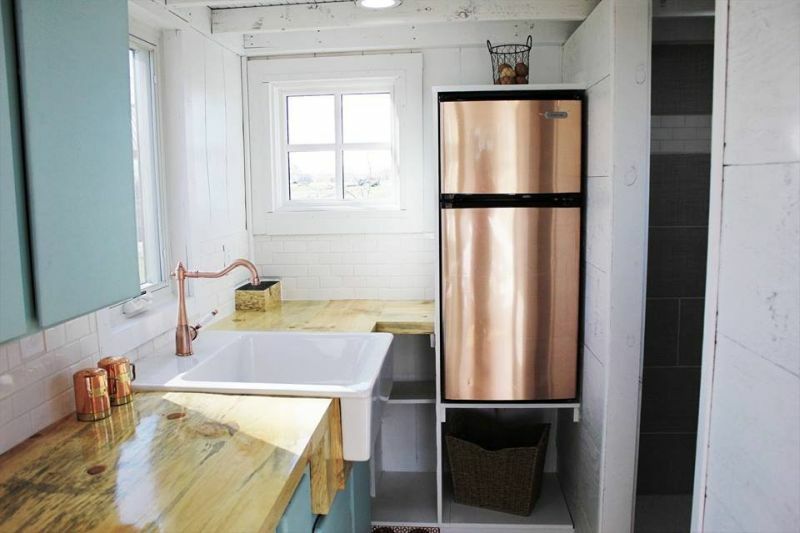 It also has a full bathroom with sink, shower, and compost toilet. 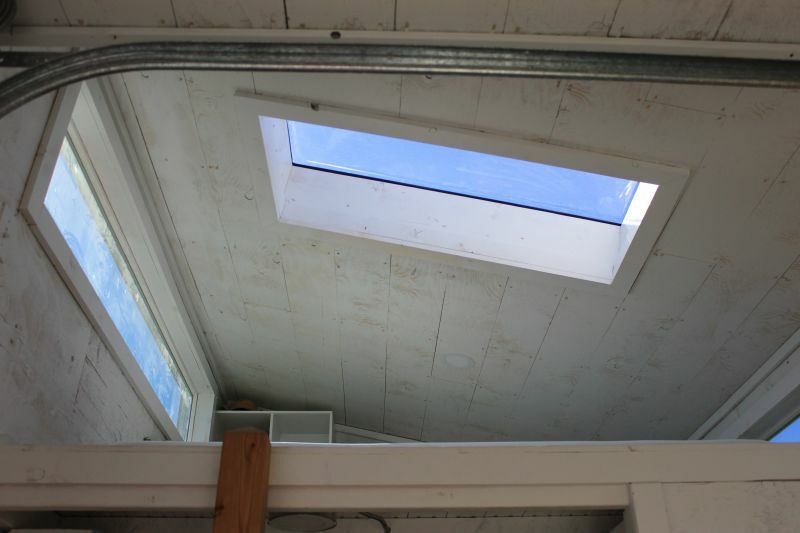 Upstairs is the bedroom with a big skylight that opens up to the rooftop deck. It is also good to see how intelligently the team has used nails to hold things in place during travel. 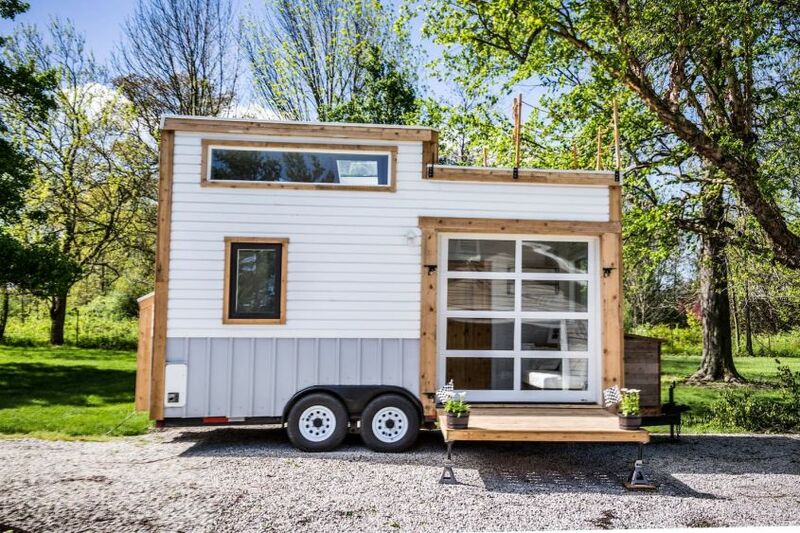 Living in this tiny house on wheels can explain what you need to downsize your lifestyle. Means, rather than craving for luxuries, one should be satisfied with minimum requirements and change the way of life. 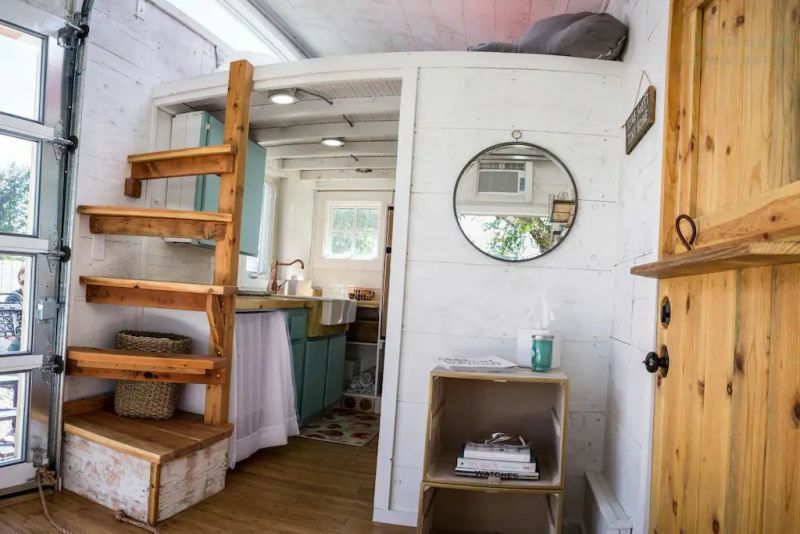 Currently, this tiny house resides in Indianapolis and can be rented for about $110 at Airbnb.